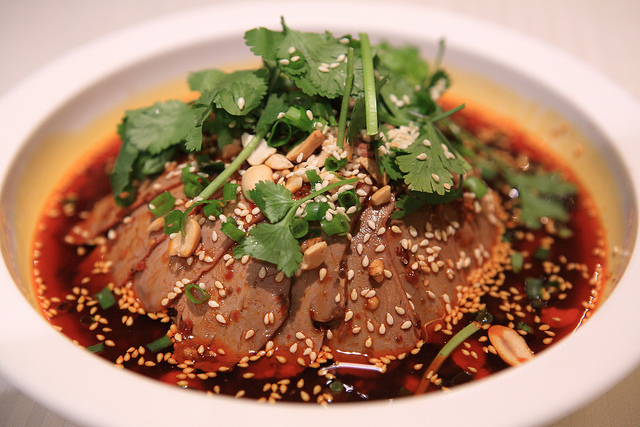 This is a dish served cold with beef meat, ox tongue, offal (beef heart), tendon, and tripe mixed with a spicy sauce. The dish is then topped with sprinkles of cilantro, peanuts, and sesame seeds. 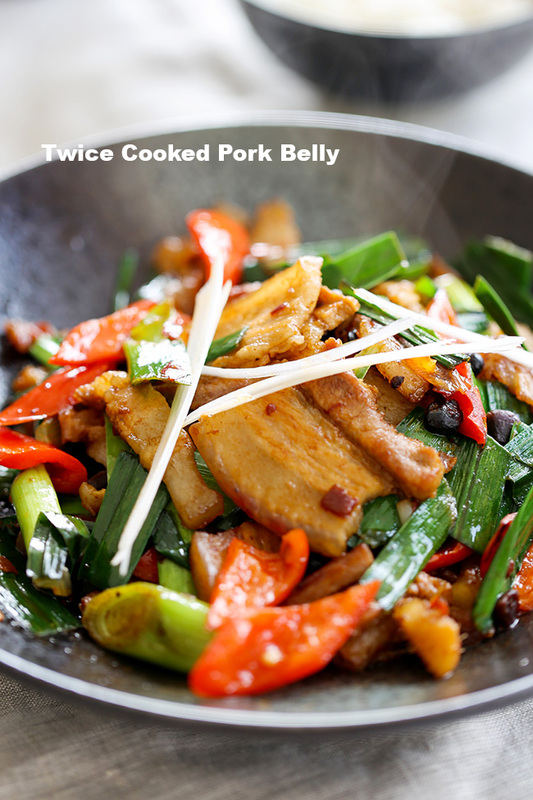 The couple who invented the dish supposedly enjoyed such a harmonious marriage that the dish was named “husband and wife lung slices”, the literal translation of its Chinese title (modern versions of this dish do not use actual lungs anymore). 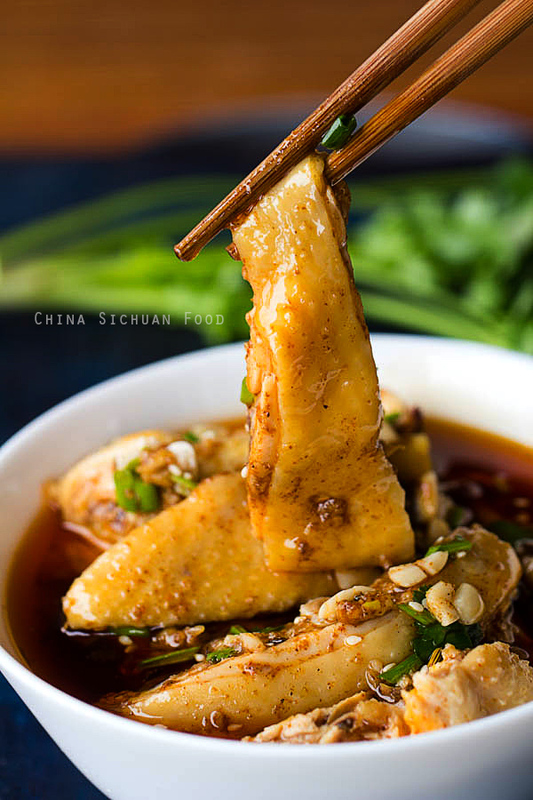 Saliva Chicken is one of the most famous Sichuan (Szechuan) style chicken dishes – poached chicken in chili sauce (or steamed chicken with chili sauce). Sichuan (Szechuan), is a province in southwest China. The Chinese name is “口水鸡” (Kou Shui Ji), so it is sometimes translated into Saliva Chicken literally. This name may sound quite weird or uncomfortable. Mouthwatering chicken is a better one. Whenever you get a chance to visit an authentic Szechuan restaurant, order it!!! 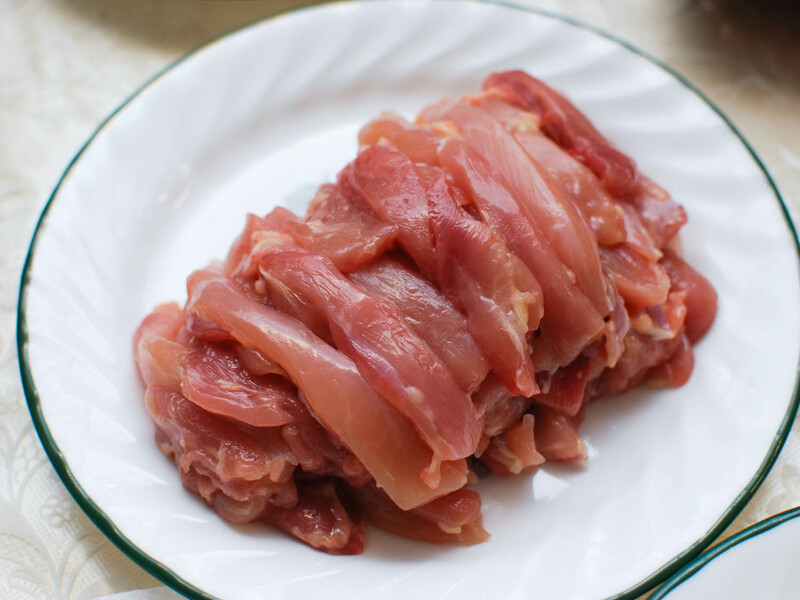 The short poaching cooking skill will make the chicken meat super tender and it is also used in Cantonese white cut chicken. After cooking, soak the chicken in iced water can tighten the skin. 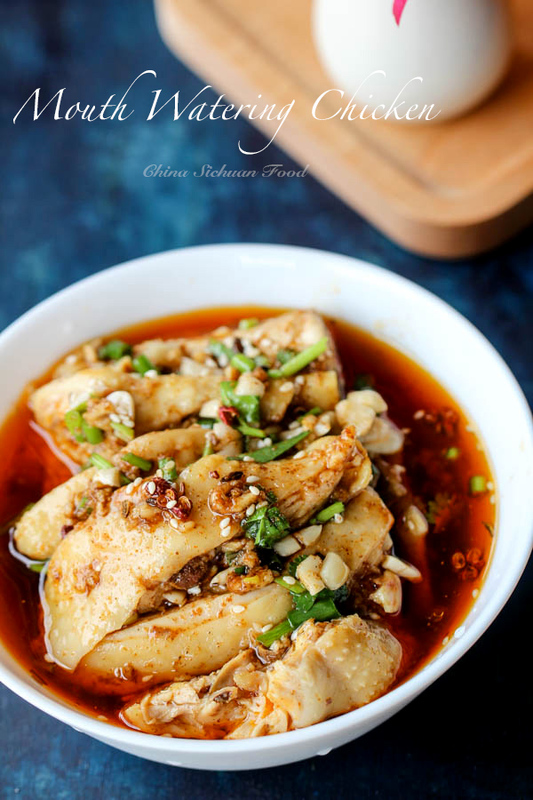 There are several important tips to make perfect Saliva Chicken at home with tender texture and excellent Szechuan style mala flavor. I would recommend using whole chicken (younger ones around 2 pounds) for this recipe as a whole chicken offers maximum chicken skin (the best part of this dish). Clean the chicken and remove feet and head. In a large pot, add chicken, green onion and 3-4 slices of ginger and cooking wine. Then pour enough water to cover the chicken. Bring the content to a boiling with medium fire and continue cooking for around 8 minutes (for longer ones, you may need 10-15 minutes). Turn off the fire, cover the lid and let the chicken stay for around 20 minutes. 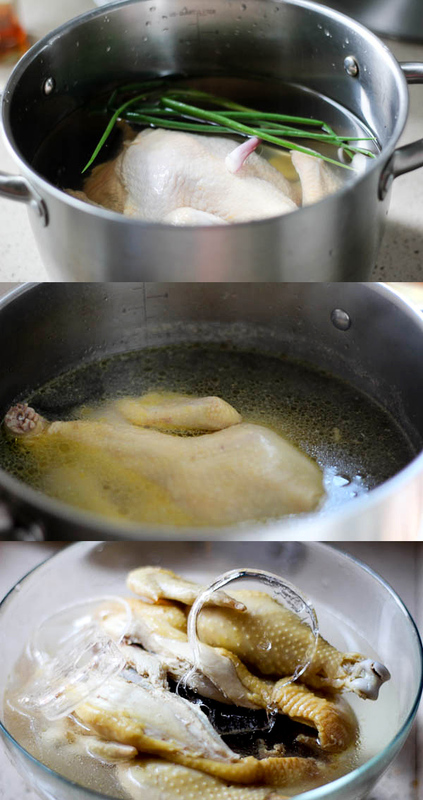 Transfer the chicken out and soak it with iced water. Turn over several times during the process until the chicken is completely cooled down. Cut chicken into chunks when it is completely cooled down to get smooth edges. 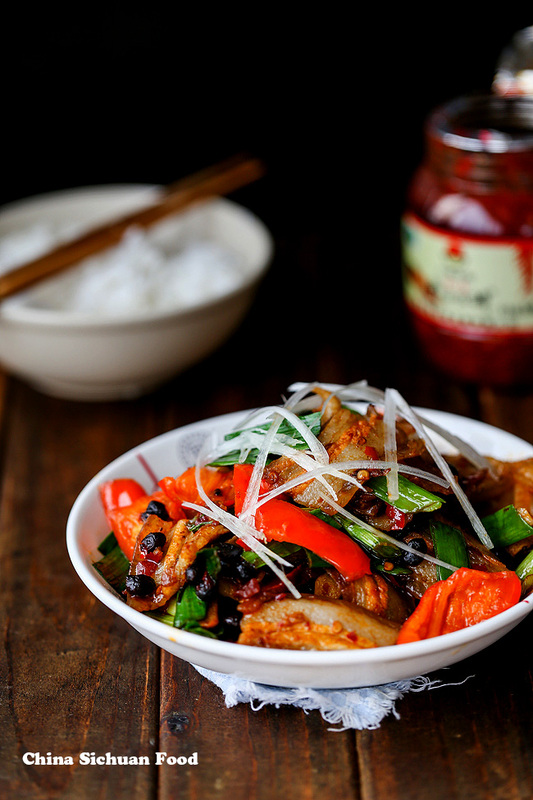 Szechuan style chili oil is the soul of this dish. Store-bought ones are good enough!! Additionally, chili oil should be prepared firstly because the color of the red oil will become brighter after hours of resting. I list the ingredient for around 1 cup of oil. However we only need around 4 to 6 tablespoons in this recipe. You can use this chili oil in many other Szechuan style dishes like bon bon chicken, or Szechuan style chicken noodle salad. 1.In a small bowl, mix chili powder, Sichuan peppercorn, five spice powder and sesame seeds. 2.In a pan, add bay leaves, ginger slices, star anise, Sichuan peppercorn(4-5) and dry red peppers, pour in around 1 cup of oil and heat until hot over slowest fire (if the spices are overheated, they become bitter). Discard all the spices and leave the oil only. 3.Pour the hot oil directly to the powder mixture in the small bowl. You will smell the strong aroma during the process. Set the Szechuan combined chili oil aside. 4.Clean the chicken and remove feet and head. In a large pot, add chicken, green onion and 3-4 slices of ginger and cooking wine. Then pour enough water to cover the chicken. Bring the content to a boiling with medium fire and continue cooking for around 8 minutes (see note 1 for the adjusting of the time needed). Turn off the fire, cover the lid and let the chicken stay for around 20 minutes. 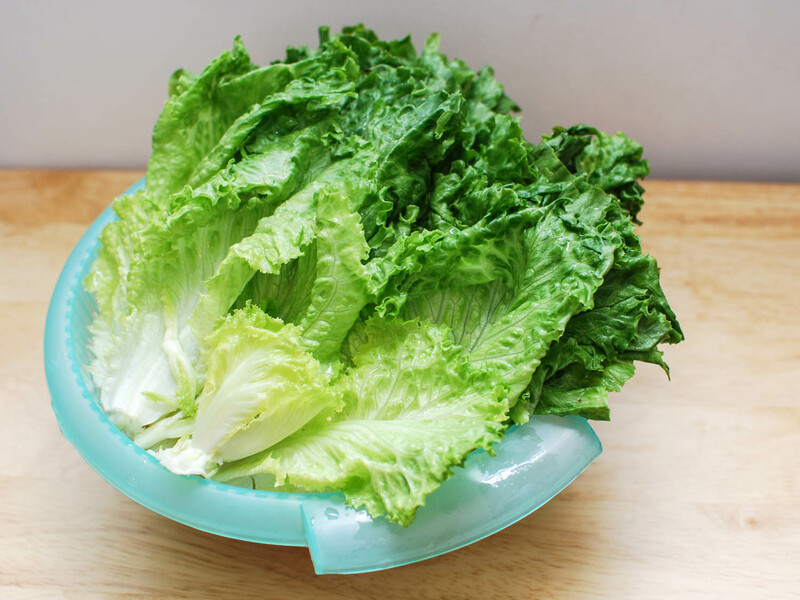 5.In a large bowl, prepare enough iced water. Transfer the chicken out and soak it with iced water. Turn over several times during the process until the chicken is completely cooled down. Cut into chunks and lay in the serving bowl. 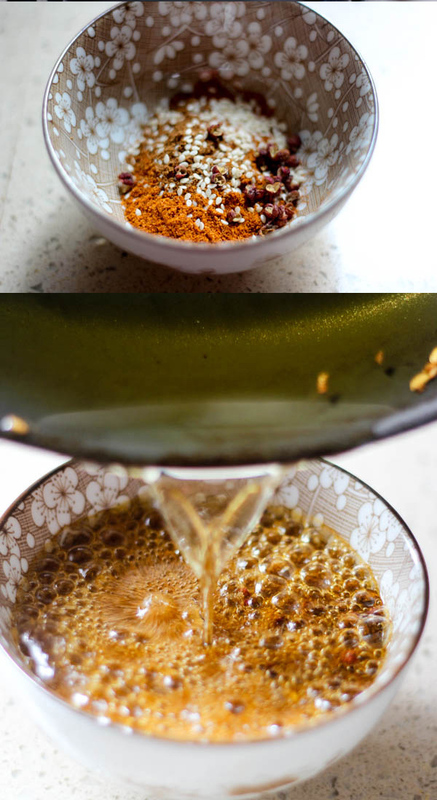 6.Mix around 4 to 6 tablespoons of chili oil with other ingredients to prepare the sauce. 7.Toast peanuts and white sesame in pan until aroma and then crush with a rolling pin or crusher. 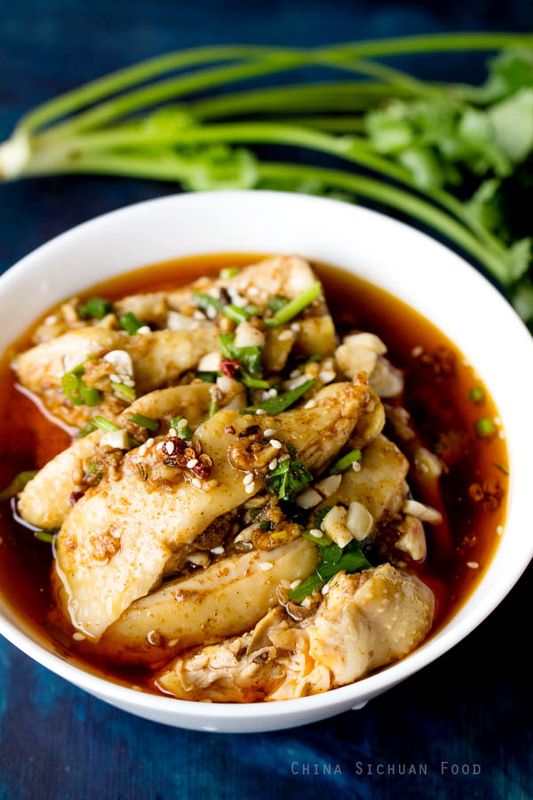 8.Pour the sauce over the chicken, garnish with toasted peanuts and white sesame seeds and enjoy! For larger chicken, lengthen the poach time but no longer than 15 minutes. Saliva Chicken 口水鸡 kǒu shuǐ jī, kǒu shuǐ means saliva. If you would like to introduce your signature dishes and promote your restaurant in our Blog section for free, please send an article of the introduction of signature dishes with some pictures to ukeatingnet[@]yahoo.com. In order to hot pot, you need a pot and a burner to keep things simmering at the table. 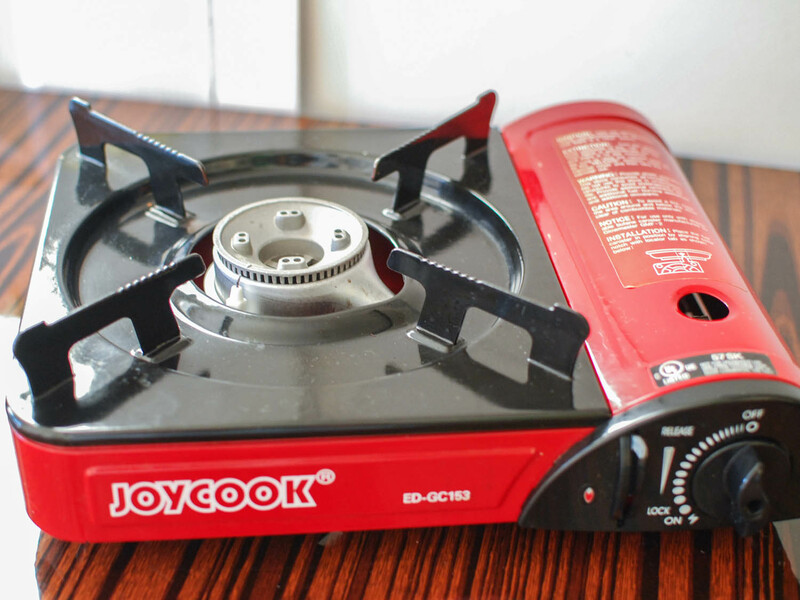 There are a variety of pots and portable burners you can choose. 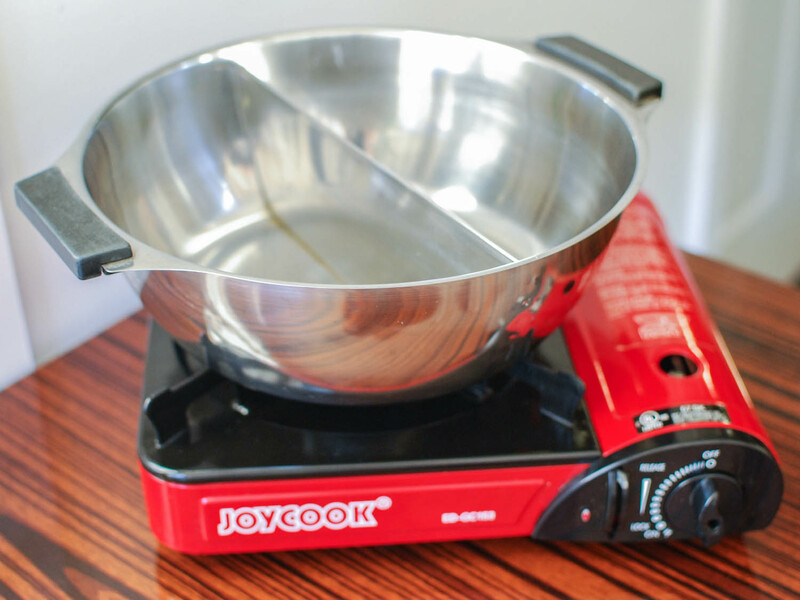 Electric and induction hot-pot sets are the easiest to clean up: you simply wipe the top surface clean with a towel. 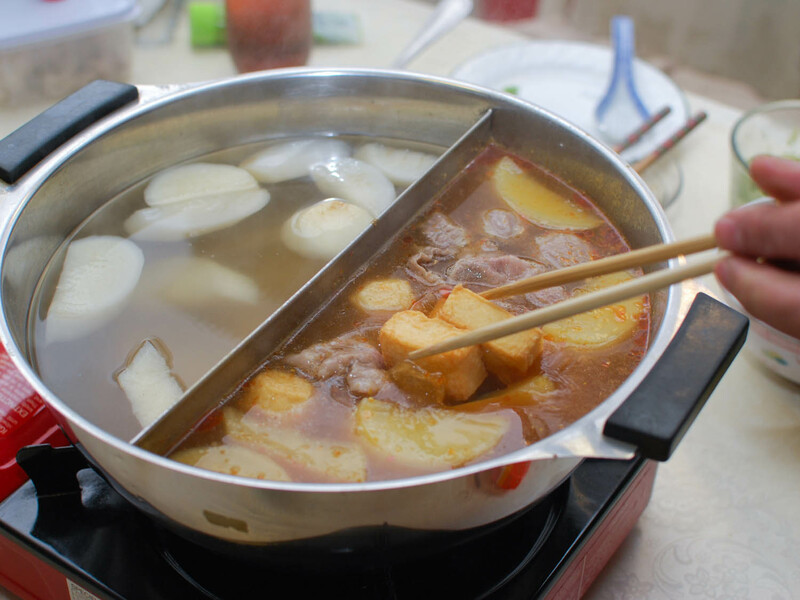 But one of my favorite ways to make hot pot is with a portable butane burner. It’s a little harder to clean, but I like the fine-tuned heat control it offers, which makes maintaining a simmer incredibly easy. Butane burners don’t often come with a pot included, so you’ll need to buy that separately, and you’ll need to replace the fuel every few hot pot sessions. 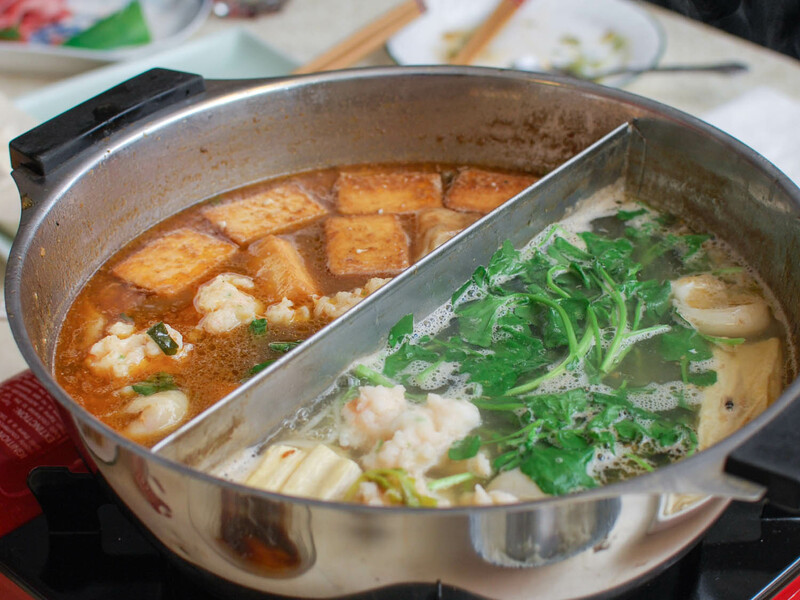 No matter which hot pot setup you end up with, look for a pot that has a separator in the middle for accommodating two broths in one pot, to get the most broth mileage out of one burner. A single pot, about 12 inches in diameter, can serve anywhere from 2 to 6 people; feeding a larger crowd will require a second pot and burner. Other than that, all you need are some basic accessories: chopsticks (different sets for dipping in the communal pot and eating), mini tongs, small strainers, spoons, shallow bowls for eating, and small bowls for dipping sauces. 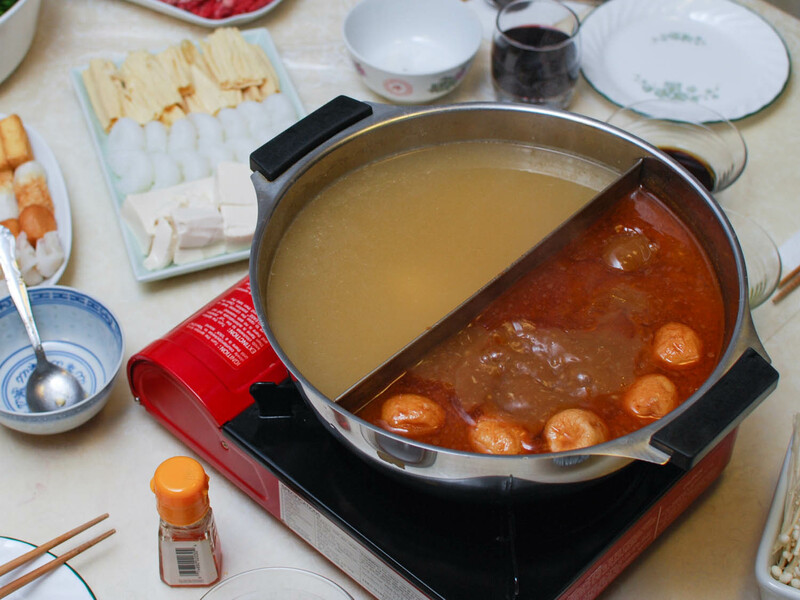 The list of foods that can be cooked in a hot pot is a long one. Variety is key, since you want to have a little bit of everything. Beef and seafood are two of the most popular foods to cook in a hot pot, but you’ll need to balance those more filling items with light ones like greens and other vegetables. 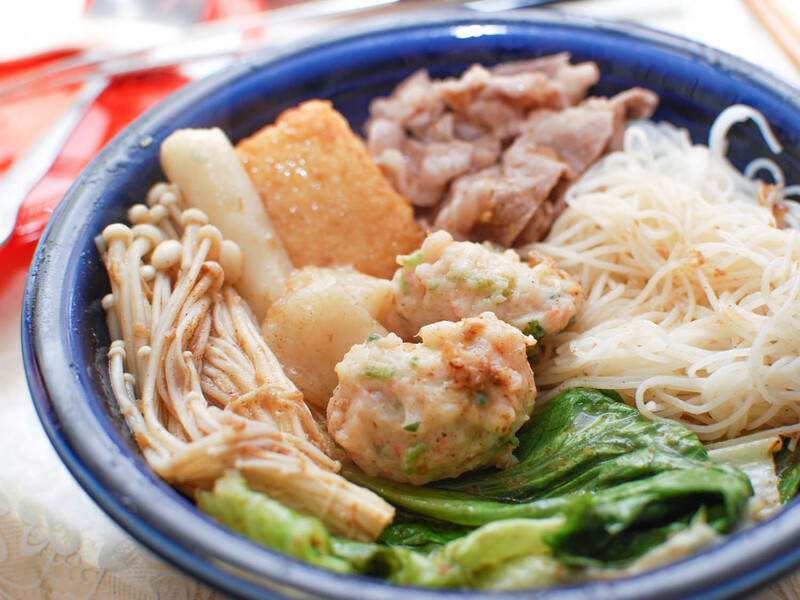 For example, for a four-person hot pot, I like to have at least two types of greens; three to four non-meat items like tofu, mushrooms and daikon; two to four meat items such as liver, beef, chicken, and tripe; two to four different kinds of seafood such as fish balls, salmon, and shrimp; and some kind of noodle: rice noodles, udon noodles or yam noodles. Here’s how to prep some of my favorite ingredients. Meat and seafood may be the centerpieces of a hot pot meal, but the feast isn’t complete without vegetables. They balance out the heavier offerings and add flavor to the broth. You can add almost any vegetable to a hot pot, but I prefer ones that retain a little bit of texture even after cooking in the broth. Leafy greens such as watercress, Chinese spinach (ong choy, water morning glory), snow pea leaves, lettuce (iceberg, red, or green), and chrysanthemum greens (tong ho). These greens are best left whole or in big pieces. Once they hit the hot broth, they begin to wilt and usually require a cooking time of just 2 to 3 minutes or less. Hearty greens such as rapeseed vegetable (yau choy), Napa cabbage, and baby bok choy. 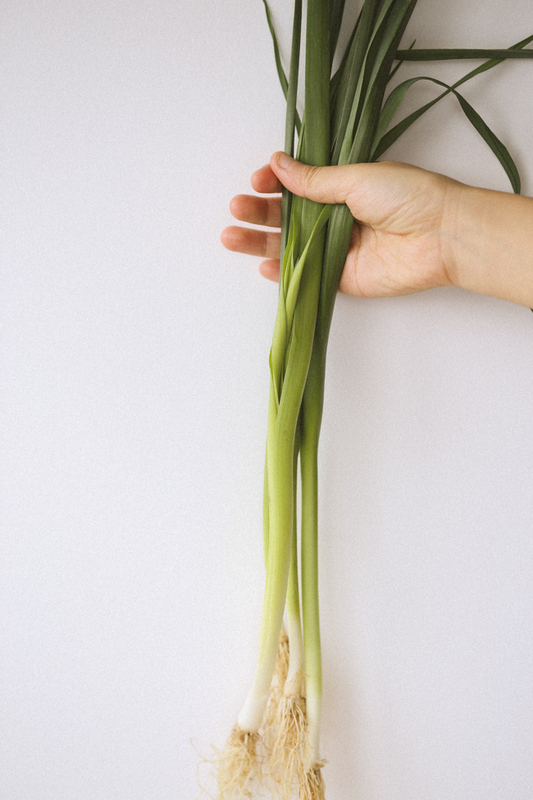 With thicker stems, these greens take a few minutes longer than leafy greens to cook. Cut them in half and cook them for about 4 to 5 minutes. Root vegetables like daikon, carrots, lotus root, and potatoes. There are two ways to prep root vegetables: They can be cut into 2-inch chunks or sliced thinly, about 1/8 inch thick. One of the benefits of cutting root vegetables into large chunks is they can be left to simmer in the broth and flavor it; this is usually done with things like daikon and carrots. Just add them in the beginning before bringing the broth to a simmer, and let them do their thing. Mushrooms, including button mushrooms, portobello, shiitake, maitake (hen-of-woods), enoki, and shimeiji. Large mushrooms such as portobello and shiitakes should be stemmed and cut in half, and usually take about 3 to 4 minutes to cook. Mushrooms with thin, edible stems, like shimeiji, should be separated into small bundles and take 1 to 3 minutes to cook. 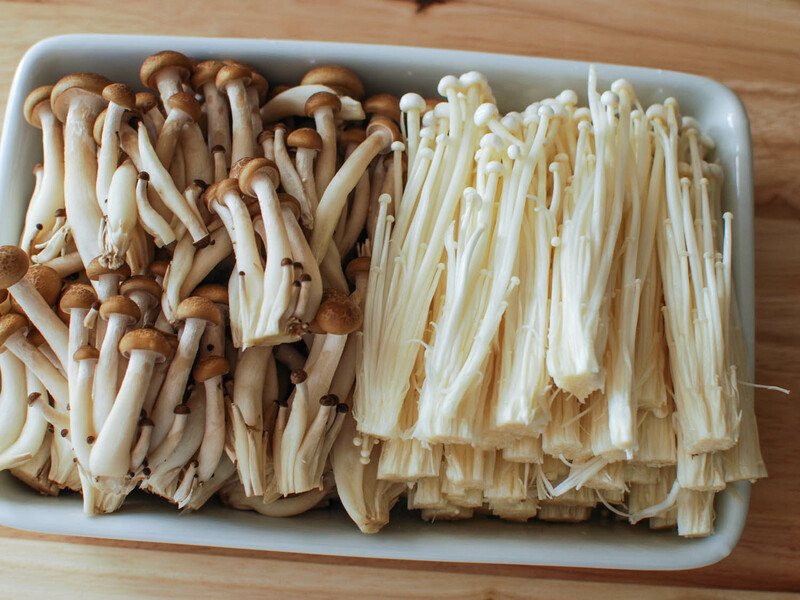 Enoki mushrooms are ready as soon as they start to wilt, which takes about 30 seconds. 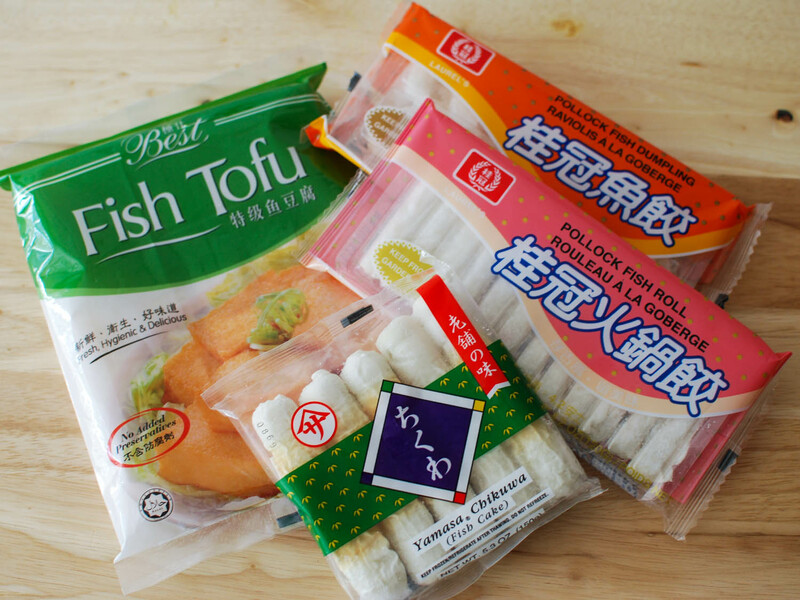 Tofu, including regular or firm tofu, tofu puffs, pressed tofu, or bean curd sticks. Since tofu is already cooked, you’re basically warming it up in the hot pot. 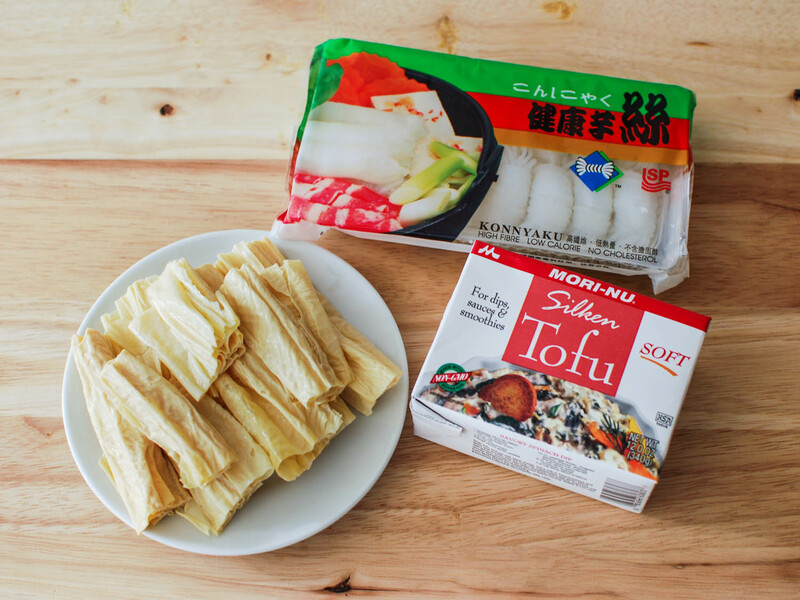 I like to cut regular and firm tofu into cubes; slice firm and pressed tofu 1/4 inch thick; and cut tofu puffs in half. 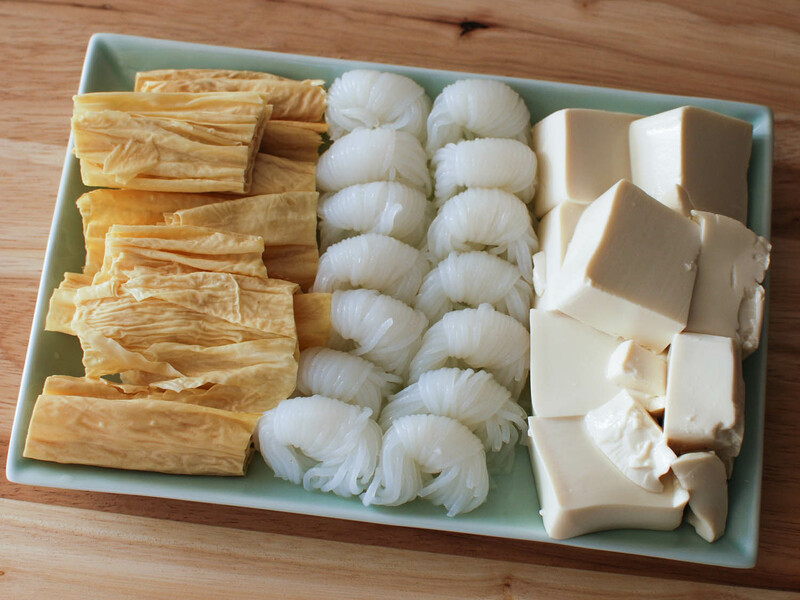 Soak dried bean curd sticks in water overnight or at least 3 hours before cooking, then cut them into 2- to 4-inch long pieces. Tomatoes are one of my favorite vegetables in a spicy hot pot. The slight sourness of the tomatoes goes great with that fiery heat. Corn, just like daikon and carrots, can be used to flavor the broth. Slice the cob of corn into 2- to 3-inch segments and let it simmer. Winter melon and kabocha squash should be skinned and cut into 2-inch chunks before being simmered until tender. Just about any meat is hot-pot-appropriate meat. Beef, pork, and lamb are best prepped as paper-thin slices. Dip them a few times in the hot pot broth and in a few seconds they are done. Unless you have a meat slicer at home, buying it pre-sliced is the way to go; you can find packages of thin pre-sliced meats in the freezer section of most Asian supermarkets. Just remember to thaw the meat before it’s time to sit down to eat. 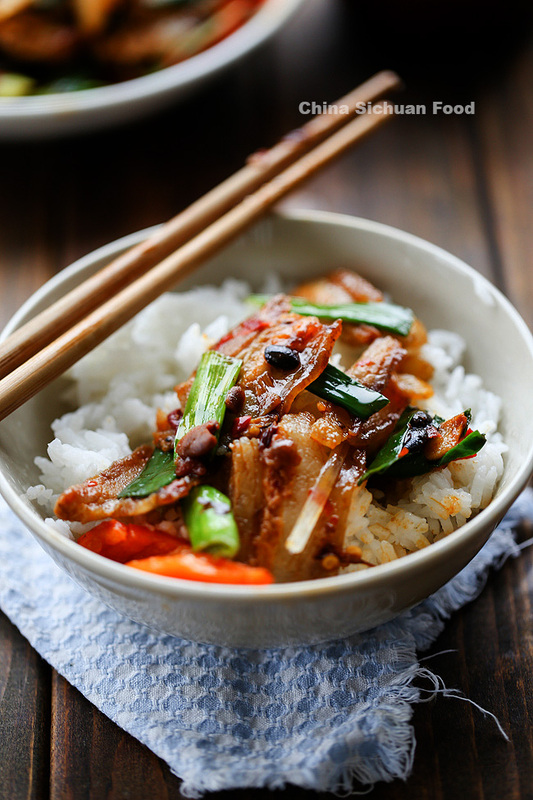 If you’re not able to find thin slices of meat, slice them as you would if you were prepping for a stir-fry. Beef, including fatty cuts (brisket, short rib, etc. ), rib eye, and Asian beef tendon meatballs. 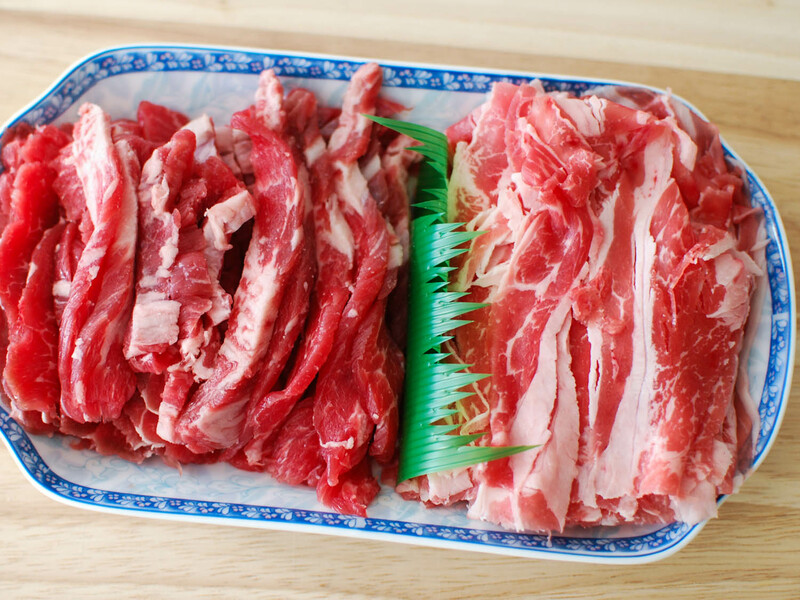 Thinly sliced fatty beef is one of the must-haves for a hot pot feast; it’s usually labeled as fatty beef, beef for hot pot, and even pastrami beef in the frozen section of Asian supermarkets. If you’re unable to find fatty beef or want a second beef option, try rib eye. Slice it against the grain, about 1/4 inch thick (or even thinner). Unlike Western-style meatballs, Asian-style tendon meatballs have a bouncy bite to them. You can usually find them frozen or refrigerated right next to the fish balls at Asian markets. Once they start to float in the hot pot, which usually takes about 4 to 5 minutes, they’re done. Lamb, in particular shoulder and leg. Just as popular as beef in China, and more popular in certain regions, lamb is another must-have. It’s usually always served as paper-thin slices. Just like fatty beef, it takes seconds to cook and can be found in the frozen section of an Asian market. Chicken, especially breast and thigh meat. 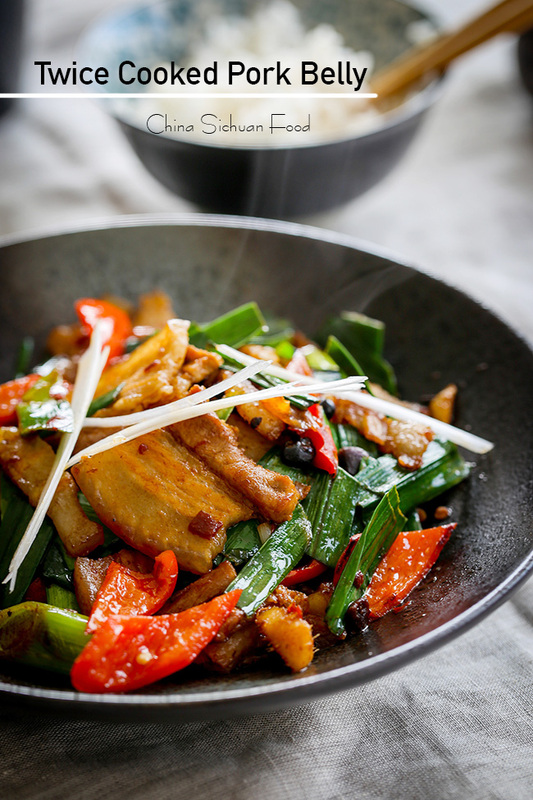 Slice both white and dark meat stir-fry size, about 1/8 to 1/4 inch thick. You can place it in the hot pot as is, but I like to marinate it with a splash of rice wine first, along with a little bit of salt, white pepper, and julienned ginger for a few minutes before cooking. Pork loin and belly: Just like beef and lamb, pork loin and belly are best sliced paper-thin—go for pre-cut. Offal: tripe, pork intestine, tongue, kidney, and liver are all delicious in the hot pot. Tripe and intestines, which are easiest to work with when purchased pre-cleaned, take at least 5 minutes to cook, but I like to leave them in the hot pot longer to soak up all the flavors of the broth. 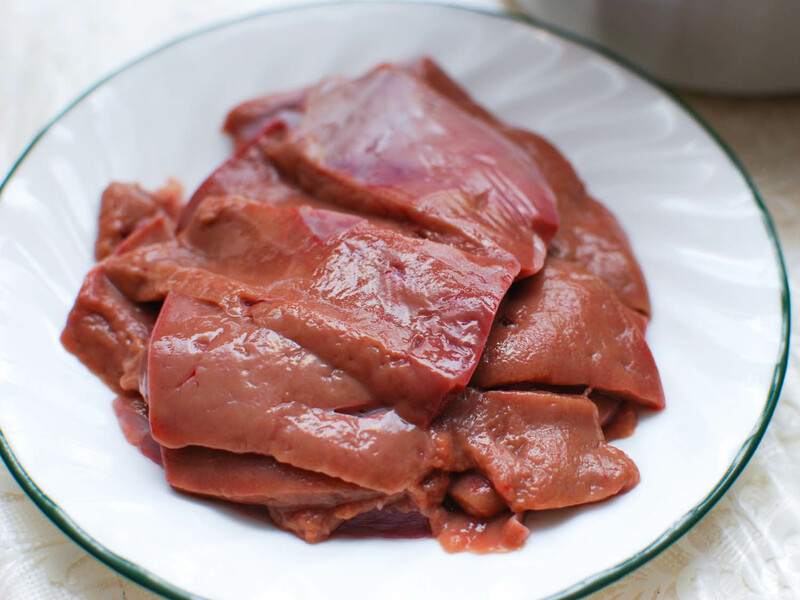 If you spot thinly sliced beef tongue at the supermarket, get it! It takes only about a minute to cook and is both tender and delicious. Kidney and liver should be thinly sliced, about 1/8 to 1/4 inch thick (they’re also good cut thicker, and scored with a cross-hatch pattern to help the heat penetrate). You can cook them as-is in the hot pot, but I like to marinate them with a little bit of rice wine, salt, white pepper, and julienned ginger for a few minutes before cooking. 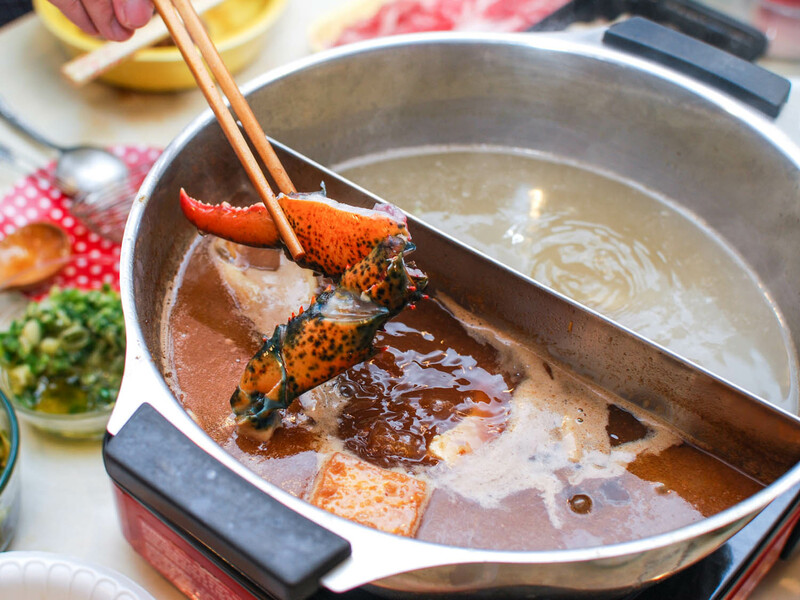 Just like meat, the variety of seafood you can cook in a hot pot is endless. Here are a few ingredients to consider, plus tips on prepping fresh seafood as well as fish balls and fish cakes. Shellfish like shrimp, scallops, lobster, crabs, oysters, clams, mussels, abalone, and geoduck. Shrimp is probably one of the most popular seafood ingredients in a hot pot, and is usually cooked whole with both the shell and head on, but you can use headless and shelled shrimp too. 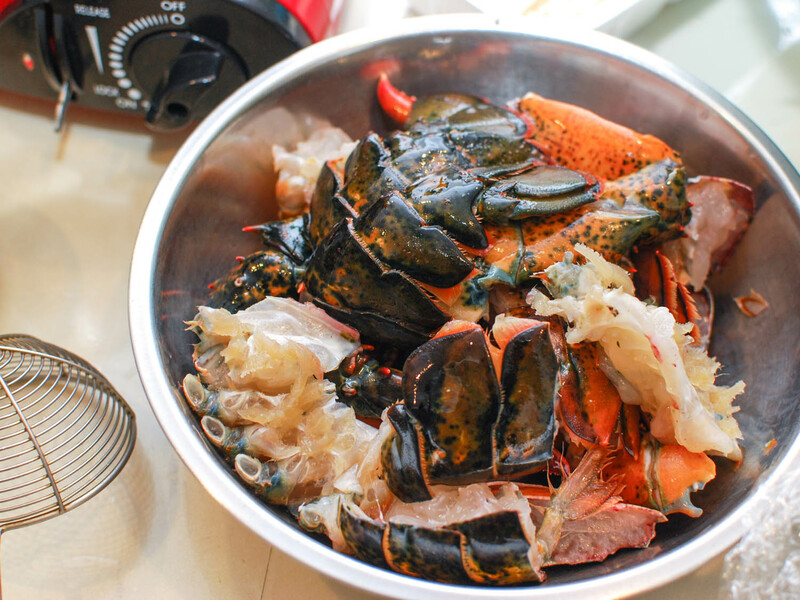 Lobsters and crabs are a great addition, the only the tricky part is chopping them into large pieces while still alive, which of course can be upsetting to some folks. Oysters should be shucked and take only a minute or two to cook. For clams, make sure they are scrubbed clean of any grit and sand; small clams such as littlenecks works best for hot pot. For mussels, remove their beards and make sure they are cleaned well before cooking. For a fancy touch, abalone and geoduck are the way to go. Abalone should be sliced thinly and will take only a few seconds to cook. Geoduck is a small pain to clean, but it’s worth it! Slice the geoduck as thin as you can and be sure not to overcook it in the hot pot—few seconds is all it takes to enjoy this sweet and tender delicacy. 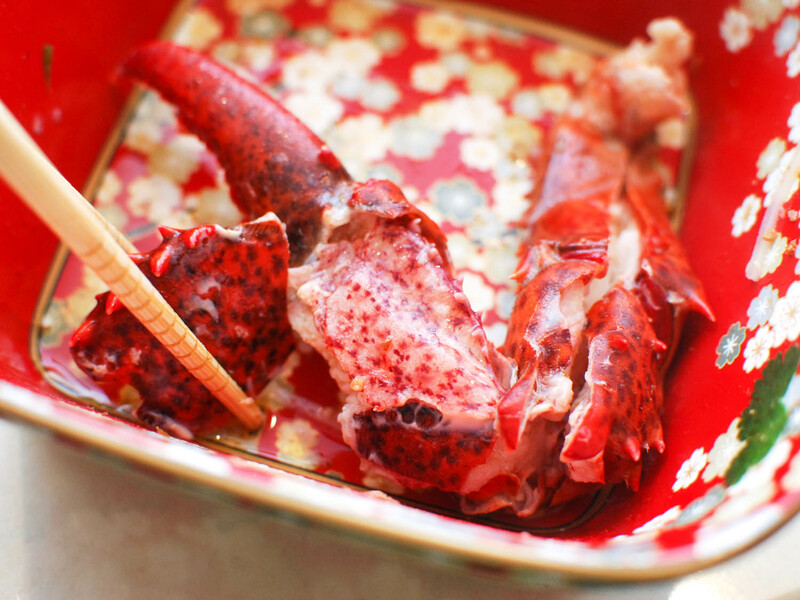 Fish, including halibut, salmon, monkfish, bass, and most other types of fresh fish are great in a hot pot. Slice the fish about a quarter inch thick. 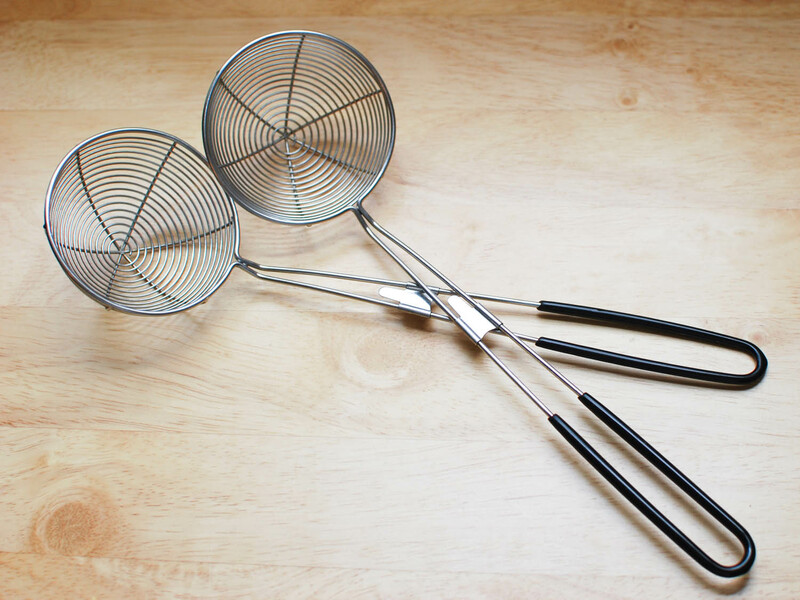 When cooking, place the fish slices in a small strainer to prevent them from getting lost in the pot. Squid and cuttlefish, both fresh and dried, make a great addition to a hot pot. With fresh squid and cuttlefish, make sure you clean the body and the tentacle parts well. Slice the body roughly 2-inch strips, making cross-hatch cuts on the surface (or you can simply cut it into thick rings). Dried cuttlefish, on the other hand, requires a little more work. It needs to be soaked in water for at least 24 hours and up to two days. Once it’s rehydrated, slice it the same way you would with the fresh ones. Unlike fresh cuttlefish or squid, dried cuttlefish has bold meaty flavor. 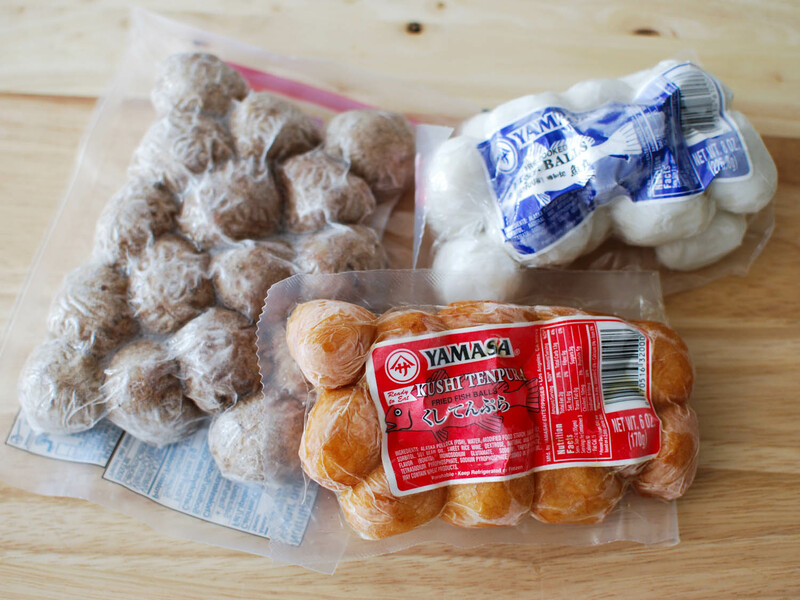 Store-bought fish balls and fish cakes, which you can find at any well-stocked Asian supermarket. They are usually always found in the freezer section and come in a variety of shapes and flavors. 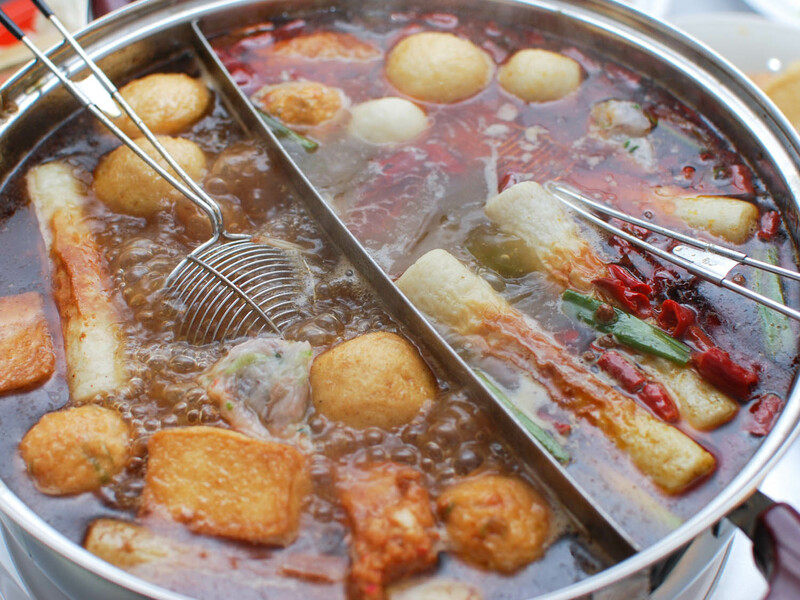 One of the most popular fish balls for hot pot are round Chinese ones, which are usually white or golden brown. 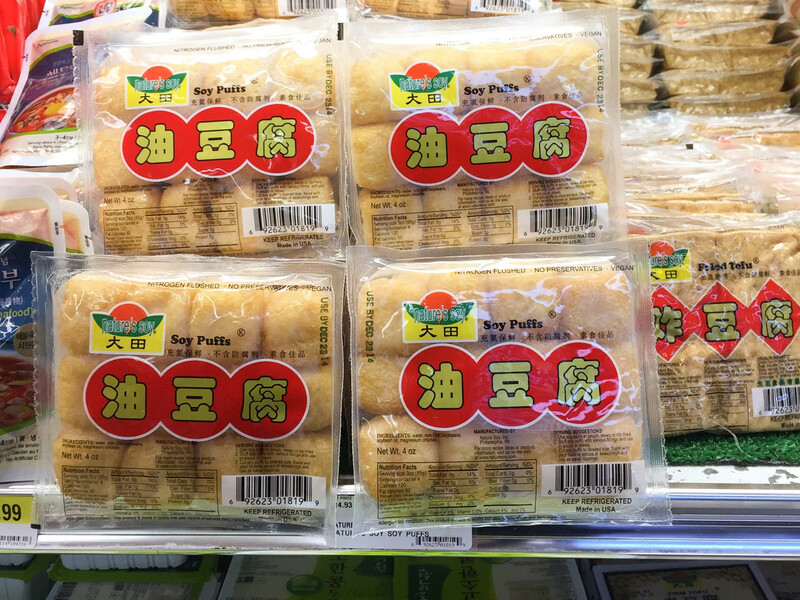 These fish balls are bouncy and fluffy in texture with a strong fish taste. Other popular Chinese fish balls include fish tofu, which are square shaped, and Fuzhou fish balls, from the Fuzhou region of China, which are stuffed with minced pork in the middle. Fish balls can also be made with shrimp, lobster, and cuttlefish. Since fish balls are already cooked when you buy them, they don’t take too long to reheat. There’s no need to defrost them first, just drop them in the broth and when they float to the surface, they’re ready. Homemade fish balls are even better than store-bought ones, but they’re also a lot more work. To make them, you have to scrape all the meat off the fish, mince it with a cleaver, and then pound it by hand. The pounding and slamming of the fish paste is the most important part, producing a bouncy and springy texture. If that sounds way too messy (which it is), there is another seafood ball you can make at home that’s a lot easier: shrimp balls. I’ll walk you through ‘em in the recipe part of this post. Vegetables, meat, and seafood are great in a hot pot, but what about the carbs? You can have white rice, but noodles are the more popular choice. 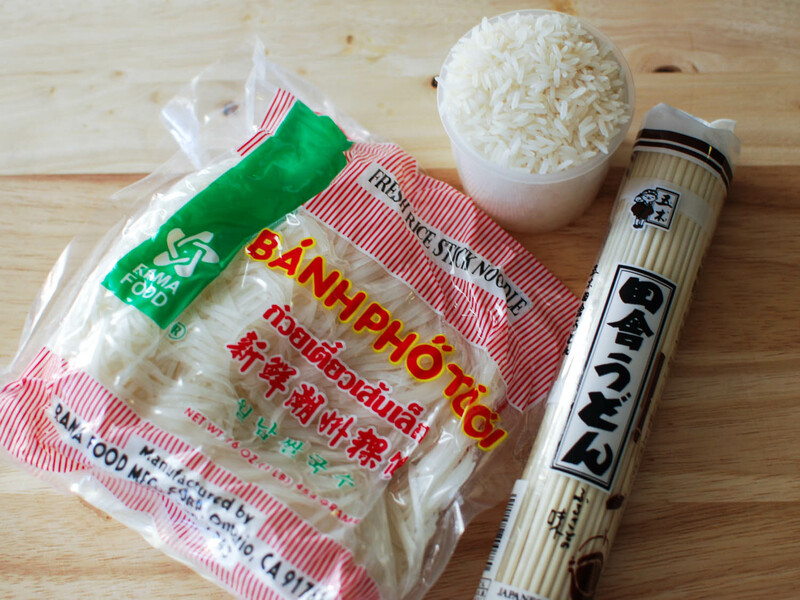 There are lots of options, including ho fun (wide white noodles), needle noodles (transparent and shaped like thick needles), and rice-stick noodles (also known as banh pho or fresh pho noodles). Fresh noodles generally take under a minute to cook. Dried rice noodles, such as vermicelli noodles, on the other hand, are best boiled in water first, then rinsed with cold water, drained, and served in a bowl alongside the other hot pot ingredients; to serve, I just set a few strands of noodles in my strainer, quickly dunk it in the broth to warm the noodles up a bit, and enjoy. Another option are yam noodles (such as shirataki noodles), which take seconds to cook and require only a quick dip in the broth. With the dipping ingredients chosen, you next have to decide what kind of broth you want to cook them in. You can keep it simple and cook everything in chicken broth (homemade or store-bought) flavored with chunks of daikon, carrots, or corn, and a few slices of ginger. 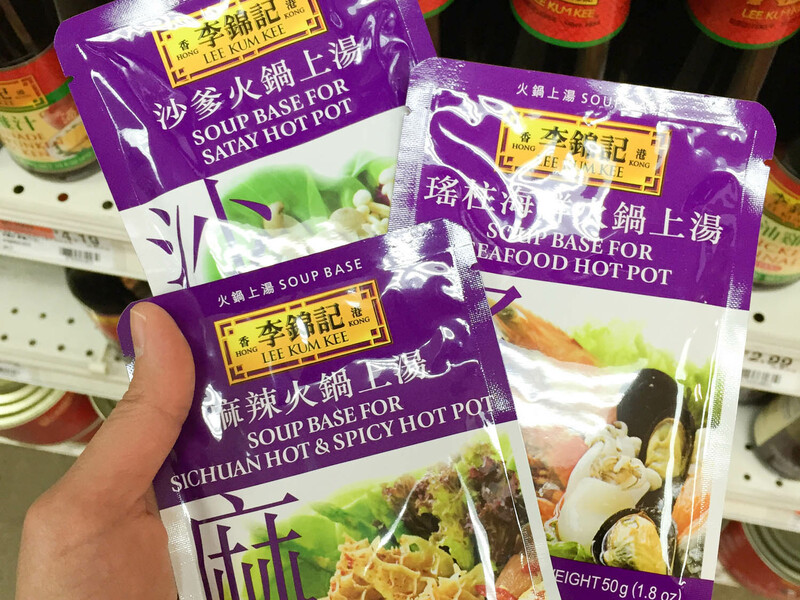 There are also packages of ready-to-use hot pot broth. 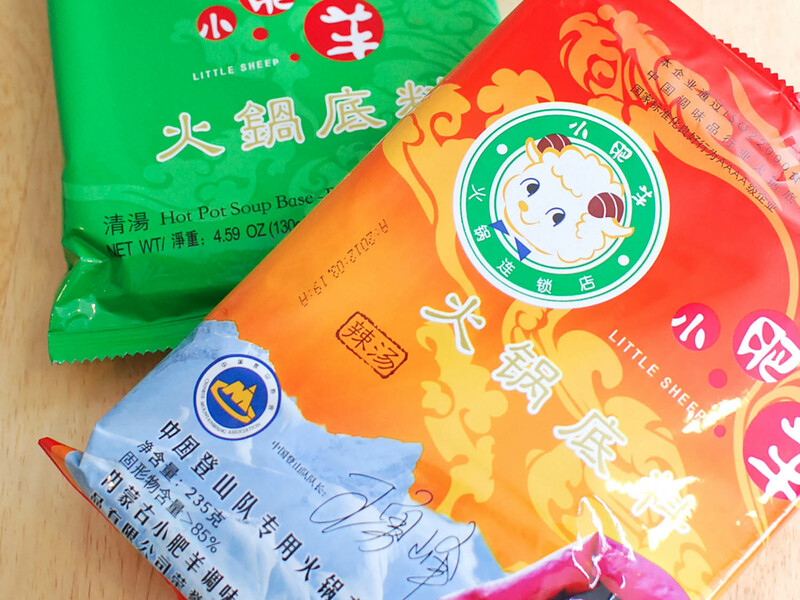 Two of my favorite brands are Lee Kum Kee and Little Sheep. If you want a broth that’s mouth numbingly spicy, Little Sheep’s Mongolian hot pot broth (the one in the red package) is the way to go. For something mild, I like Lee Kum Kee’s Seafood Hot Pot base, which is good for non-seafood ingredients as well. My all-time favorite hot broth is one that’s flavored with sacha sauce. Also known as Chinese barbecue sauce or satay sauce, sacha sauce resembles nothing like American-style barbecue sauce or the Southeast Asian peanut-based sauce we usually associate with satay. 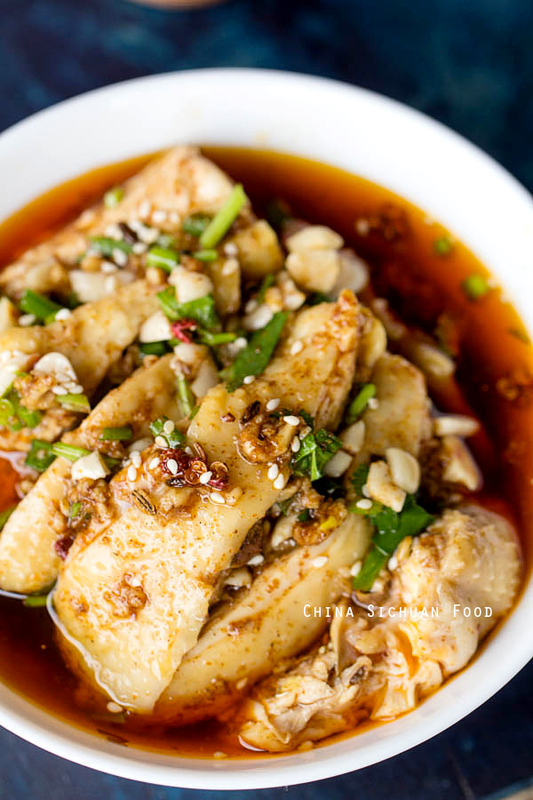 It’s made with soybean oil, garlic, chilies, dried shrimp, and brill fish. The most popular brand is BullHead, which is a tiny bit sour and comes in spicy version and non-spicy versions. Before you start feasting on your hot pot feast, you can’t forget about the dipping sauces. Just like the broth, there are many options. To keep it simple, I like to make a quick one by combing soy sauce with a drizzle of sesame oil and a touch of chili oil or chili flakes. You can also add chopped cilantro and/or scallions, or even fresh bird’s eye chili pepper to it. Another popular simple dipping sauce is egg yolk: just separate the yolk from a very fresh egg, stir it, and that’s the dipping sauce (obviously avoid this if you have salmonella concerns). The yolk is especially good with meat like fatty beef and lamb. Other good dipping sauces to have on hand are a ginger-scallion sauce (great with seafood and vegetables) and a scallion-and-hot pepper sauce (perfect for noodles and meat). I’ve got all the recipes for you, don’t worry. Using separate plates for each of your ingredients might look pretty, but in a small space it’s just not practical. Ingredients that are in the same category, such as meat ingredients like fatty beef and lamb, or seafood items like fish balls and fish cakes, can all be placed together on one big plate. Also remember that you don’t need to put out all the ingredients at once: Fish balls, for instance, can be simmered from frozen, so it’s best to put just a few out at a time, keeping the rest in the freezer and replenishing as needed. The same goes for other seafood ingredients like shrimp, fish, and squid: keep some of it the fridge, topping up the plates as they run low. Chopstick washing: It happens to everyone. You simply forgot about that shrimp, or mushroom, or beef, or whatever delicious thing you were cooking just a few minutes ago. Now it’s lost in a sea of fish balls, vegetables, and tofu. Do rescue it, but don’t do it by swishing your eating chopstick back and forth in the broth. My friend likes to call this maneuver “chopstick washing.” Use a hot pot strainer to track it down instead! Can’t touch this: It’s just sitting there, bobbing in the broth, waiting for someone to scoop it up, put it on their plate, sauce it, and eat it. It could be a piece of lobster tail, or a slice of chicken, but whatever it is, make sure it’s yours. Not sure? Check if anyone has already staked their claim on it. No double-brothing: Having more than one kind of broth available is a good thing, so don’t ruin it. Maybe not everyone can eat spicy food, or maybe there’s a guest with a seafood allergy. Or maybe you just like having two broths because you can. This means that it’s not nice to begin cooking a piece of food in one broth and then finish cooking it in the other broth. Respect the divide: No crossing over. House rules trump all rules, including these: You and your friends don’t care about “chopstick washing”? Why should you if you’re among people you’ve known for years? And do you all agree that it’s no big deal who dropped that shrimp in the pot? In the end, a hot meal is all about family and friends coming together, cooking, eating, talking, and enjoying each other’s company over a big pot of food, so do whatever makes you all comfortable. And there you have it, everything you need to know to get started with Chinese hot pot at home. If you are looking for a great place to eat in or around the United Kingdom, you won’t be disappointed! The UK’s thriving restaurant scene offers something for everyone. From fine dining to pub food, Mediterranean cuisine to traditional English, Chinese to Indian and so much more. Whether you are on a tight budget or have lots to spend for a big party or celebration there is something for everyone in the UK. Many of the restaurants are of a very high quality and there’s a really intriguing mix of restaurants which seem to thrive because the UK is such an amazing place to visit with it’s fabulous heritage, spectacular events, activities and festivals happening throughout the year. We hope you find this website a help as you make your choice of UK restaurant.